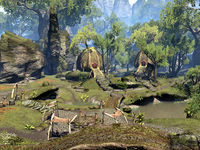 Bramblebreach is a Bosmer settlement in eastern Greenshade, south of Marbruk. The village is known for its skilled craftsmanship of smoking pipes, constructed of smooth wood. Bramblebreach Objective: Negotiate with the Bramblebreach clan for the Dominion.